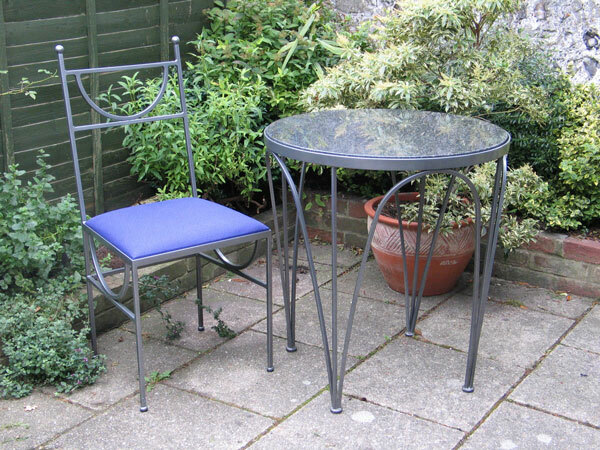 Tahlia: Tahlia patio table and chairs in mild steel shown with zinc and pewter finish (other finishes available). The table shown has a 20mm bon accord granite top, however other granites are available. Please see Materials and Finishes Pages for further details. This table and chairs were commissioned for The Alternative Feng Shui Show Garden at the 2005 RHS Hampton Court Palace Flower Show.